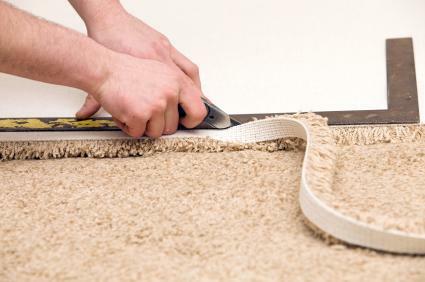 Installing your own carpet can be a major job, depending on the size of the room. It can also be very physically demanding. However, if you're confident in your ability to take on this type of home improvement, it can save you a lot of money and give you the satisfaction of a job well done. Before gathering your materials and tools for the job, determine the size of the area that you are trying to cover. The easiest way to do this is to take a tape measure and measure the longest walls in the room. To calculate the square yardage, multiply the length by the width and divide this number by nine. Add 10% to your total to allow for any mistakes or unusual cuts that you might have to make. Repeat this for every room that you are going to carpet. After you have removed the old flooring, make sure the surface of the floor you are covering is completely clean. Sweep or vacuum any debris you find. If there are doors in the room you're going to carpet, it is best to remove them while you install the carpet. While this is not absolutely necessary, it can make things easier. Install the tack strips by cutting them to the appropriate size with your tack strip cutter. Nail the strips 1/2 inch away from the wall (use the epoxy adhesive if you are installing the strips on a concrete floor). If there is an existing tack strip from previous carpeting, nail down the new one right next to the old one. Make sure you don't install the strips over a doorway because the carpet tacks can poke through. Install the carpet padding. Secure the pad to the floor by using a staple gun or use a special padding adhesive. Staple the padding near the tack strips and along any seams. Secure the seams further by sealing them with duct tape. Trim the extra padding by the walls with a utility knife so that the tack strips are exposed. Roll the carpet across the room. Cut the carpet to fit around any corners or obstacles such as floor radiators. Make sure to leave at least 3-inches extra next to the walls. Create seams where two pieces of carpet join together. Make sure the edges are perfectly straight along the seam. Lay seaming tape under the seam with the adhesive side up. Place the seaming iron directly on the tape for 15 to 30 seconds. Carefully slide the iron along the tape while pressing the seam into the glue behind the iron. Use the knee kicker to attach the carpet to the tack strips at one end of the room. Place the knee kicker on the carpet two or three inches away from the wall and use your knee against the padded side to forcefully shove and stretch the carpet over the tack strips. Use the wall trimmer to trim the excess carpet against the wall, then use the stair tool to press the edge of the carpet underneath the baseboard. 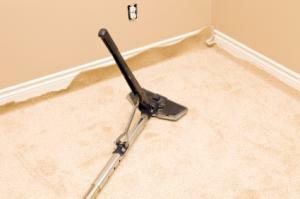 Use the power stretcher to stretch the carpet tight and attach it to the tack strips on the other walls. In places where you can't use the power stretcher, use the knee kicker to stretch and attach the carpet to the tack strips. Trim and tuck the carpet at each wall under the baseboard using the stair tool. Secure the carpet at doorways using transition molding. Once you get familiar with all the tools used for installing carpets, the process is not difficult. However, it does require a certain amount of strength and energy to stretch and kick the carpet into place. Once your carpet is installed, re-hang the doors, move the furniture back into the room and enjoy your new flooring.